The MotionFaçade LED is the perfect companion to the MotionDrape LED. At 2m x 1.22m, the MotionFaçade LED makes a perfect front board for a DJ. 66 tri-color SMD LEDs power 30 different effects which is easily run in conjunction with the MotionDrape LED or on its own via the included controller or DMX. Considering purchasing the Chauvet Motion Facade? Have questions? Ask people who've recently bought one. Do you own the Chauvet Motion Facade? Why not write a review based on your experience with it. Very nice easy to set up starcloth with excellent pre built in programs for a really nice visual display. Looks even better when used with the Chauvet motion backdrop. Unfortunately, it shipped without its control cable (missing from factory sealed box so not DJ Kit's fault) but James sorted me out in no time and a new cable was with me 2 days later direct from Chauvet. A really cool looking effect for your setup, perfect for mobile DJs who like to add the wow factor to their setup!! 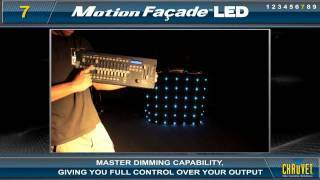 Seen a video for Chauvet Motion Facade online or have you own video? 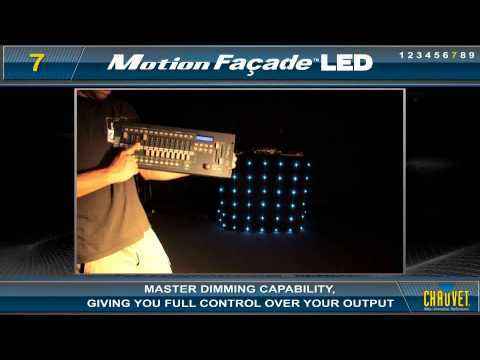 Check out Chauvet Motion Facade on DJkit.com!